I had to go into town yesterday, as I mentioned. It was a typical town visit – I sat around for hours while Herself vanished. Once she gets a smell of a shop she dematerialises like something out of Star Trek, and I don’t see her for ages. Then she re-materialises, laden down with stuff we don’t need. She has even phoned me on occasions to tell me which shop she’s in. The strange thing is that I’m in that shop at the time and I still can’t see her. The main object of the exercise was to get myself kitted out. The invitation said ‘black tie’ but that’s daft. You’d freeze to death wearing only a black tie, and anyway, I’d have nowhere to put my pipe and tobacco. So I phoned a friend [I’d already asked the audience, and done a 50:50 but they were useless]. The friend said that what they really meant was a monkey suit. Why the hell couldn’t they say? So I went off and got fitted. I am going to look great on the night. Very suave. very elegant. Very distinguished. I can practice my guerilla tactics on the audience..? That’s a gorilla suit – it’s a monkey suit you’re supposed to be wearing. Herself will have to sew a tail on, otherwise they will put you in the wrong category. Er. I think you will go down a storm. Fit right in too. Bugger! He swore it was a monkey suit. You just can’t trust these cowboys any more. Nice suit, and going incognito is always a good idea. You never know how many paparazzi would be lying in wait, hidden behind the potted plants. Yes, Cathy, I like my anonim anonym annonimy privacy. I don’t want to become a ‘celebrity’ after all. That I’d love to see – although I’m pretty sure that’s a gorilla suit. Why not cut the arse out of it and you could fool people into thinking its a baboon suit. Wouldn’t be so keen on seeing that though. Go on!! I Dare ya! How much are the tickets? Even I’d pay to see that one. Mind you, with that gorilla suit, you’re set up for a career in novelty marathon running. B3n – €270 [plus VAT] a hit. A snip to be in my company. Hang on – perhaps that’s what you’re supposed to do with the tie: wear it as a tail for your monkey suit! It’s all just fallen into place. Does herself ever tell you what a twit you are? 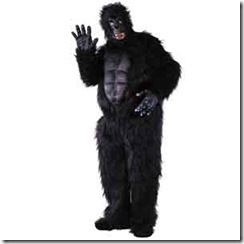 On reflection, it would be a breach of etiquette to wear a tail with the gorilla suit. Tails are for morning dress and black tie is evening dress. It would be like passing the port decanter the wrong way around the table, the embarrassment would be such that you would have to go outside and shoot yourself. I dare you to go into Garda HQ and ask for directions to the zoo! Thanks Ian. Once again, you’ve put my mind at rest. I’m glad I’m doing the right thing. K8 – Don’t forget… You’re coming with me. what are you dressing as? I’m sure you could find someplace for the pipe and tobacco. Also, you should wear a pink bough in your gorilla hair, so as to not get into trouble with the other gorilla males over mating territory and such nonsense. Holy crap are you paying that for ticket or are you a special guest? like the suit. * And you bring home at least one fecking Spider! You’ll truly floor ’em when you get there! And possibly get shot as well. To what address do I send the flowers and sympathy card then? Dalif – If I wore a pink bow in my hair I’d risk unwanted intentions by other gorillas. Not a nice thought..
Flirty – I’m the Interval Act. Steph – Thank you. Though the Spiders aren’t on until next week. Tonight is the NetVisionary awards. I’ve been barred from there. Kirk – Just send ’em to Granny at GrannyLostThePlot. The address is on my sidebar. Since, as of this morning (my time) you seem to be alive and kicking (unless you have a bunch of already written posts set up in WLW to publish at future times over a period of the next few days just to yank your reader’s chains which I wouldn’t doubt whatsoever since you seem to be that kind of guy and if so, how the hell do you “auto-reply to comments then? ), I canceled the order for flowers and the sympathy card. Too bad really…they were real nice. Don’t let it get about and about but I’m actually glad your still around. Hmmm, I better get another cup of coffee…I don’t sound like myself. Kirk – What are you waffling about? Today is today, whichever side of the Pond you’re on. Why should I be dead yet? The gorilla thing doesn’t happen until next Thursday. Tonight, I shall remain quietly at home getting smashed, or stoned [whichever is easier]. I intend to be around tomorrow, unless of course Herself and I decide to have one of our little ‘disagreements’. Ah Jeeez, Told ya’ I needed another cup of coffee. I totally missed the time of the event even though I read the posts more than once. I really need to talk to my doc about that medication. I’ll leave the flowers and sympathy card on standby then. And I suggest doing both at once. It pays to multi task at times. Addendum: Ho-ho! Got that WP-Ajax-Edit-Comments plugin loaded up ay? A fine thing to be doing for your loyal readership. An extra toke for you sir. It’s something a little stronger than coffee you need, Kirk. Librium? Vallium? Prozak? Addendum: 🙂 Thanks for the plugin! I raided your plugin page. As if I didn’t have enough already……!